The Tower of London is a castle located on the northern bank of the River Thames to the south east of the City of London and next to Tower Bridge. It is a World Heritage Site, although this status is currently under threat because of the number and scale of tall buildings which have been erected nearby and which are considered by UNESCO to threaten the setting. Conflict between the commercial need for tall buildings and the need to conserve views of the Tower is not new, in the 1860s the multi-storey 'Mazawattee' tea warehouse was built on the edge of Tower Hill, controversially blocking the view of the castle. 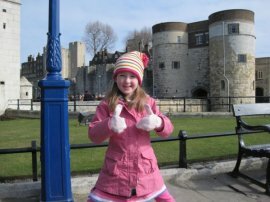 The importance of the Tower of London to the history of England is immense. It is a landmark site for both protection and control of the City of London. As the gateway to the capital for centuries the Tower of London was the stronghold of the City symbolising the continuity of the English monarchy. On view at the Tower are the Crown Jewels, the contents of the Armoury, a reconstruction of Walter Raleigh's study and exhibitions relating to the princes in the tower and the former royal menagerie. The Tower of London was built by William the Conqueror as a part of the consolidation of the Norman conquest of England in 1066 and to demonstrate the Norman dynasty's lordship over the land. In 1078 work commenced on the White Tower which gives the castle its name and which replaced the original earth and timber fortifications on the site. The Tower was completed by William's son Rufus in 1100 and the fortress and royal residences dominated the city. To the north and east it was protected by the old Roman wall which surrounded London while a new ditch and ramparts were built to surround the north and west sides. In 1238 Henry III retreated to the Tower and ringed the castle with a new wall. His son, Edward I, ringed this outer wall with another making two concentric walls with a water filled moat between. The additions of Henry III and his son made the Tower into one of the most innovative and influential castle sites in Europe. The Tower is a rare example of a continuously developing ensemble of royal buildings evolving from the 11th to the 16th centuries. It has great national and international significance for the impact that the Norman Conquest of England had on fostering closer ties with Europe, on English language and culture and in creating one of the most important monarchies in Europe. Over the years the continuous use of the Tower by successive monarchs fostered the development of several major State Institutions including roles in the nation's defence, it's records and it's coinage. Its numerous overlapping uses have included: as a palace; a treasury; a gaol (especially for political prisoners); the Royal Mint; a public records office; a zoo (started when Henry III was given an elephant by Louis IX of France); a storehouse; a barracks; an arsenal and a repository for the Crown Jewels.